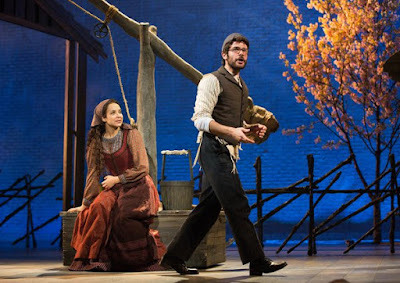 Bartlett Sher’s interpretation of Fiddler on the Roof casts fresh eyes over one of the most beloved shows in the canon. Sheldon Harnick's lyrics remain as written, but much of the dance has been deliciously expanded, transforming a 20th century classic, about 19th century Russia, into a 21st century masterpiece. Memorable Fiddlers have always been about the Tevye - and on this review visit, the much lauded Danny Burstein was replaced by understudy Adam Grupper. To be fair, as the evening played out, Grupper grew wonderfully into the role with the classic narrative losing nothing through the re-shuffle, for in this Fiddler, above all, it is the sum of its parts that define its magnificence. Jessica Hecht's Golde is as wise and all-knowing as Harnick and Stein intended. Torn between her maternal love for her kids and her spiritual commitment to her faith, the pain as these two worlds collide with daughter Chava's marriage to the gentile Fyedka, she breaks our hearts, struggling with her dilemma. Whilst Sholom Aleichem’s characters may all have been larger than life, Hecht keeps her Golde inspirationally grounded – and beautifully voiced! Perhaps the most enchanting dynamic on stage is the love that blossoms between Alexandra Silber's Tzeitel (Tevye and Golde's eldest child) and Adam Kantor's Motel the tailor. Silber is no stranger to the show having been a delightful Hodel in London's West End 8 years ago. Here however, and in a role that convinces as a teenager, she brings a well-crafted interpretation to the complex nuances of the young woman she portrays. Her terror at the thought of marriage to the much older Lazar Wolf is palpable, whilst her love for Motel is as believable as is heartwarming. And, of course, Silber possess one of the finest musical theatre presences of her generation, bringing a piquancy to Matchmaker that explores new depths within the famed lyrics. Likewise, Kantor's Motel is a delight. I last reviewed the actor in his recording of Jason Robert Brown's The Last Five Years and it is clear that he is as comfortable in portraying a young Jewish man's angst irrespective of the century his character is placed in. His take on Motel, the charming nebbish who grows a spine, makes us love and laugh with, the tailor – with his take on Miracle Of Miracles proving a delight. To be fair, Samantha Massell's Hodel alongside Melanie Moore's Chava both offer an enchanting and revived look as the elder of Tzeitel's four siblings - and in a nod to another understudy, George Psomas' Perchik was a class act too. Bartlett Sher's direction is at once sensitive and inspirational. The opening scene sees "Tevye", anorak clad in the modern day, arriving at Anatevka station, guidebook in hand. As he reads his guidebook aloud, it is clear that this Fiddler is not just celebrating the Jews of Tsarist Russia, it is also memorialising the Jewish communities of Europe, so throughly eradicated by Hitler some 40 years later and with a gruesome efficiency that the Tsar could only have dreamed of. Sher's use of the Fiddler too - weaving throughout so much of the action only enhances the music's roots. The final expulsion from Anatevka - the characters silhouetted only in relief, is as tragic as it is brilliantly simple. It's the little touches too - as the Jews of Anatevka are dispersed we see Lazar Wolf (in a wonderful turn from Adam Dannheisser), unnoticed and seeking no thanks, slip a wad of cash into the impoverished Tevye's luggage. Michael Yeargan’s set design is ingenious, combining simplicity with world class stage technology. In a show that memorialises the destruction of European Jewry as much as telling the fabled tales from the shtetl, characters don’t just come on from the wings they emerge, walking up steps from an upstage pit, enhancing the setting's spirituality. Some of the scenery is wooden cottages that the characters inhabit, whilst other constructions are smaller homes that hover, ghost like, above the action, suggesting the style of the Marc Chagall pictures that so famously inspired Bock, Harnick and the show's original director Hal Prince, back when Fiddler was evolving in the 1960's. Hofesh Shechter’s choreography is visionary. His routines respect Jerome Robbin's original themes, but with more music to play with, there is even more of Bock's fabulous fusion of klezmer and cantorial to set the movement to. The big numbers of Tradition and Tevye's Dream are re-imagined here in an explosion of dance that brings this forgotten world of orthodox Judaism bang up to date. And where The Wedding is usually remembered for its breathtaking bottle dancing, Schechter doesn't disappoint - but rather expands the celebration into a joyous explosion of dance that sees the gender barriers taken down with wit and subtlety. There is also something re-assuringly "authentic" in seeing the show in New York, and with a significantly Jewish cast. Whilst theatre does not need to be confined to racial or gender constraints, remember that this show was originally written by the descendants of European immigrants, for an American audience. Listen carefully to the self-deprecating Jewish humour that Harnick delicately sprinkles over his lyrics and there's echoes of Frank Loesser and Damon Runyon, along with an ironic seam that continues to this day in the work of Mel Brooks and others. Fiddler on the Roof works beautifully on Broadway. As its timeless message demands to be unforgettable, so is this show unmissable.